If you’ve spent any time around me talking about the making of new instruments, you know how big a fan I am of the great modern makers and their creations. I was fortunate to visit one of the greatest living violin makers, Kurt Widenhouse, when I was a young cellist just starting my journey to learn the instrument. I took my student instrument to him for an adjustment and I can still remember standing by his bench as he worked. Above his bench were photos of greats musicians like Aaron Rosand, standing next to Kurt with one of Kurt’s violins. All the photos had loving inscriptions from the players, praising him for his instruments. I also saw Kurt’s awards and learned that there was such a thing as a violin making competition. Whether I was aware of it at the time or not, that is when I made the connection between a modern instrument from a living maker and the musician who played it. I realized that there could be a kind of communication between the player and maker that was impossible with the dead masters from the past. That communication could shape not only the maker’s work, but the musician’s art as well. Little did I know that these new kernels of knowledge would lodge deeply in my psyche and help guide me to the present. There is very little about building a violin family instrument that isn’t fascinating. 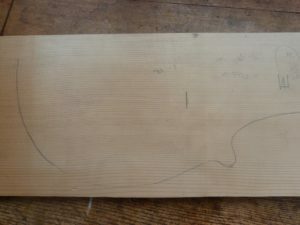 The ideal trees for violin making grow in a particular area, are felled at a particular time of year, are split in a particular way, and are stored for particular amount of time. Once they are ready to use, they are measured for moisture content, specific gravity, sound transmission speed, grain structure, and aesthetic characteristics. As many makers have learned as they uttered a silent curse (or not so silent), even all of this doesn’t prevent a treasured piece of wood from hiding a fatal flaw once the tools start removing material. The tools used are varied in size and purpose. From the #7 jointer plane down to the smallest scraper, one thing is constant – everything needs to be sharp! The sound of a sharp chisel passing through spruce is one of the loveliest things you will ever hear. Even the glue is specialized and must possess just the right attributes – strong enough to hold the instrument together but capable of releasing in case of repairs. The process of varnishing an instrument can vary tremendously, and each maker tailors his methods to achieve the results he desires. Even the shaping of the fingerboard and fitting of the bridge express a particular maker’s ideas and personal ideals. Every step of the process is worthy of a book unto itself. One of the greatest thrills of my job is the opportunity to work with these masters, bringing creations from their shop to ours for you to play.